I’ve been to Hong Kong a number of times in recent years and every time I visit, a trip to Macau is usually on the to-do list. But somehow I always seem to run out of time. This time was different. 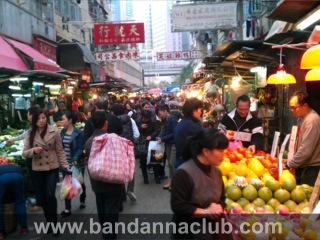 After getting settled in to the Eaton hotel on Nathan road, I started looking into the best way to visit Macau. While the TurboJET looked interesting, it did involve a longish taxi or MTR ride to the terminal on the Hong Kong Island side of the harbour. And since I was in no particular rush, I instead opted for the regular ferry service, run from the Hong Kong China ferry terminal, about a 15-minute walk from the Eaton Hotel. Since Macau is an autonomous territory (much like Hong Kong) you have to take your passport with you and go through a sort of cut-down version of the departure / arrival procedures that most airports have. This includes the completion of departure cards, check-in, stamping of passports, but not the x-ray, metal-detector stuff so much. A round trip ticket on 1st Ferry cost me HK$270 (about 22 quid) and trip took about an hour each way. The seats were spacious and comfortable and once the ferry cleared the harbour, it picked up speed and soon we were doing heading briskly across the south china sea. Once you clear Macau passport control and customs you have to run a little bit of a gauntlet of special duty-free offers, rickshaw and taxi touts and the inevitable casino shuttle buses before you can head on down the main drag, but if you put your smiley face on and just stroll past them all, you won’t be hassled too much. I had picked up a tourist map at the ferry terminal and after having a brief look at a handful of the harbourside casinos, I sat down to study the map in detail. It was a hot and very humid day and I soon realised that in order to see some of the more interesting locations, I would need transport. So I wandered back to the ferry terminal and negotiated a deal with one of the local chaps who spoke passable English, to take me to several of the World Heritage sites in the historic centre of Macau. We agreed on a 2 and a half hour tour for HK$650 (about 55 quid), which wasn’t overly cheap, but seemed the best way to see a reasonable chunk of Macau without walking my feet off. We headed off in his air-conditioned people-mover (ahhh bliss!) along the main drag, while my erstwhile guide gave me a few simple factoids; Macau has a population of over half a million people, crammed together in a space of just under 30 square kilometers. It’s known first and foremost as a gambling mecca. Other chief economic activities in Macau are export-geared textile and garment manufacturing, banking and other financial services. 10 minutes later, we arrived at the first agreed stop, the A-Ma temple situated on the southwest tip of the Macau Peninsula, which is one of the oldest and most famous temples in Macau. Built in 1488, the temple is dedicated to the goddess of seafarers and fishermen Matsu. While my guide found a shady spot, I set off to have a closer look. As temples go, it was interesting enough and had a few things of note. Chief among these was a bronze bowl about the size of a large meat dish with two brass handles, one on either side. When someone dipped their hands in the water and then rolled their hands over the brass handles in a smooth arc, the bowl spouted a tiny fountain, much to the delight of all onlookers. The next stop was the historic centre of Macau, which included some interesting examples of Portuguese architecture, all well maintained and painted in a variety of interesting colours. These included the Senado Square, the Na Tcha Temple and the Ruins of St Paul’s. Despite the heat, the place was pretty crowded with visitors and part of the square was adorned with large overhead nets, filled with giant paper lotus blossoms, remnants of the 9th Macau Lotus Festival, held earlier this year. Everywhere, street hawkers sold what appear to be the chief food specialties of Macau; freshly baked almond cookies and a range of spicy beef jerky. After wandering round the square, the Moorish barracks and the Mount Fortress, I paid a brief visit to the Museum but time was running out and I didn’t get a chance to spend a lot of time there. While there were no shortage of people around, parts of Macau have quite a run-down look; graffiti adorns the sides of many buildings and there were a number of almost derelict buildings around the periphery, which were in stark contract to the smart-looking town centre. The overall impression was of somewhere that had known better times, but was still trying to put a brave face on things. With my time up, we headed back to the Ferry terminal and after obtaining my return ferry ticket (by exchanging a transfer voucher supplied to me in Kowloon) I headed back to Kowloon. As Macau fell away into the mist, I decided that I definitely had to come back. You can’t really get a sense of any place in just a few hours and there were enough interesting places on my map which I didn’t get a chance to visit this time, to justify another visit. So long for now Macau. Macau is wonderful, but only at the right time of the year. It’s too hot and humid there during the tai fun season. As the typhoon season runs from the beginning of April until the end of September, I guess that means Macau is only viable 6 months of the year…? 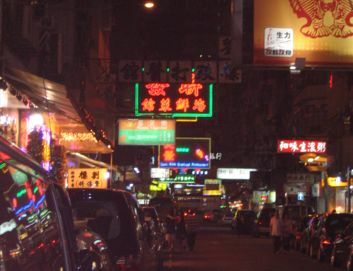 Sorry, comments for this article (Meandering in Macau) are now closed.